After the child’s home, school represents the second most influential environment in a child’s life. Our philosophy is “Healthy Children Learn Better” and to that end we want to make every effort to keep your child safe and healthy at school. At school our full-time Health Clerk works with an assigned Credentialed School Nurse from Evergreen School District to provide coordinated care, screenings and health education for our students. To learn more about the services provided, please click on the headings below. 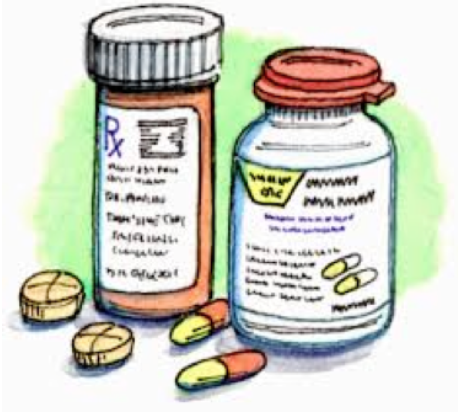 All medications required to be taken at school must have a school medication form (D-189) signed by the physician and parent (including over-the-counter medications). Forms are available in the school office. All medications must be sent to school in a prescription bottle or the original labeled container. NO MEDICATION WILL BE ACCEPTED IN AN UNLABELED/HAND LABELED CONTAINER. All medication must be brought in by the parent and kept in the office where it will be administered. Parents must pick up all medications from the office every June and complete D-189 every August. The child must assume the responsibility for reporting to the office at the specified time for the medication. Immunizations must be kept up-to-date for students to remain in school. Under a California law SB277, beginning January 1, 2016, exemptions based on personal beliefs will no longer be an option for the vaccines that are currently required for entry into child care or school in California. Most families will not be affected by the law because their children have received all required vaccination. For more information about school immunization requirements and resources, please visit the California Department of Public Health’s website , or contact your local health department Immunization Education and Planning Program 408-937-2271. TDAP Immunization is mandatory. A school immunization law requires all students entering 7 grade in California to be immunized with a pertussis (whooping cough) vaccine booster called Tdap. Pertussis is a very contagious respiratory disease that can be severe and last for months. The immunity received from either early childhood immunization or pertussis disease wears off over time, leaving older students and adults susceptible again to pertussis. Immunization with Tdap can protect students, school and communities against pertussis. All students entering into 7th grade will need proof of a Tdap shot given on or after their 7th grade birthday before starting school. Parents need to present documentation of their child’s vaccination record to the front office. The school vision testing program plays a vital role in the early identification of serious vision problems that might negatively affect both the health and learning of children. Annually the school nurse conducts vision screenings on all students when they first enter school and in transitional kindergarten, kindergarten, and second and fifth grades. Students who are referred are also screened. If your child fails a screening at school, a notice will be sent home referring them to a doctor for full diagnostic testing. Annual hearing screenings are conducted in first, second and fifth grades; by referral and upon first entry to the school. If your child fails a screening at school, a notice will be sent home referring them to a doctor or audiologist for full diagnostic testing. To learn more about health care coverage from Covered California and Medi-Cal visit the All In Health Care for All Families website or, view this Medi-Cal and Covered California Enrollment Information flyer. Children who need help with glasses, medication and other physical problems are assisted in the nurses office. Families in need of food, clothing or health insurance may contact the the school's front office for support from the nurses in Evergreen School District. Parents will be notified immediately of any emergency involving their children. Our full-time health clerk and assigned registered nurse are available to administer first aid if necessary. In the event your child becomes ill or injured, it is vital that up-to-date emergency contact information is available in your PowerSchool Parent Portal and that if your school has them that Emergency Cards are on file with current information in the front office.